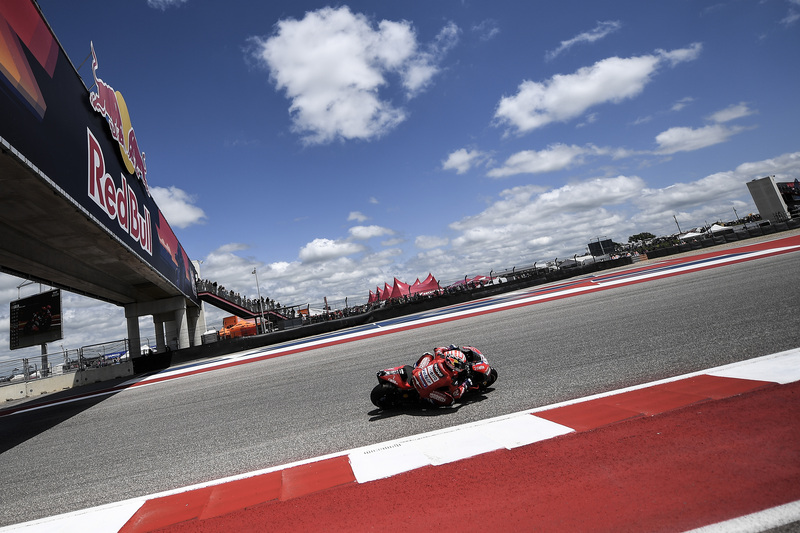 The lack of FP3 sessions made FP4 a crucial session for the MotoGP riders ahead of qualifying on Saturday in Texas for round three of the 2019 season. 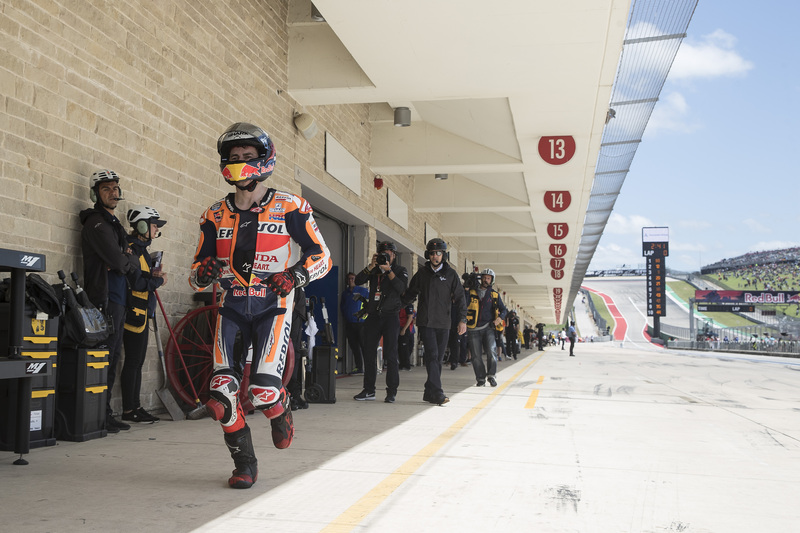 Electrical storms had brought rain and the threat of lightning to the Circuit of the Americas, but by the mid-point of FP4, Marc Marquez (Repsol Honda Team) was out on slick tyres. At one point he had five seconds on the field. That gap came down to two seconds by the end of free practice, but going into qualifying he was the outstanding favourite. Before he and the other Q2 contestants were out on track, though, there was Q1, from which Jorge Lorenzo (Repsol Honda Team) and Danilo Petrucci (Mission Winnow Ducati) advanced to Q2, after a late charge from the pair of them which was almost completely unexpected. This was a disaster for Andrea Dovizioso (Mission Winnow Ducati). After making a mistake with the front tyre yesterday in FP2 (the Italian chose the medium front tyre instead of the soft), Dovizioso made another tyre-related error in Q1, deciding to run only one rear tyre for the session. The track improved a lot, though, and in the end it was his teammate, Petrucci, who bumped him out by less than a tenth of a second, much to the disappointment of Davide Tardozzi. Mostly, Q2 went as expected. Marquez took pole position, although it was clearly not comfortable for the Spaniard. Two tenths was his advantage over Valentino Rossi (Monster Energy Yamaha MotoGP) in a surprising second place, but Marquez’ Honda made it difficult for the seven times World Champion, weaving in the straight, which according to Marquez was due to the wind. It was clearly quite violent – his foot came off the foot peg and Marquez himself admitted to rolling the throttle, which is obviously not something the #93 makes a habit of. Nonetheless, his 100% record of setting the fastest time in qualifying at Texas goes on. Rossi’s performance was impressive. In FP4 he was quite strong in the mixed conditions he has tended to struggle with in the past, and in Q2 he was able to latch onto Cal Crutchlow (LCR Honda CASTROL) for his first properly hot lap (the first attempt by Rossi was ruined by running wide on the exit of turn nine, which put him off line in turn ten and off the track on the exit), and he marginally improved on that time on his second run. Rossi’s worry on Friday was his race pace, but without the chance to try anything new today with the cancellation of FP3 and the mixed conditions of FP4, the warm up will be important for the Italian to try some changes. Equally impressive was Cal Crutchlow who qualified third. The Briton has been strong all weekend and has a real chance of the podium tomorrow, so a front row start is important. Also, for Crutchlow, who is without a front row since Assen last year, a clear view of the first corner will be a welcome sight after the disappointment of Argentina. Jack Miller (Lamborghini Pramac Racing) has had a bit of a special weekend, one similar to that we see from Marc Marquez. When the Honda doesn’t work, Marc makes it work, and that is precisely what Miller has done this weekend with the Ducati. Miller was the only GP19 to make it through to Q2 direct from free practice (the only other Ducati was his Pramac teammate, Pecco Bagnaia), and even when Petrucci joined him in Q2 after advancing from Q1, Miller beat his teammate of 2018 by just under three tenths, which in 2019 MotoGP terms is a significant margin. One of the Australian’s biggest strengths is his ability to grit his teeth and push on regardless of what the bike is saying to him. 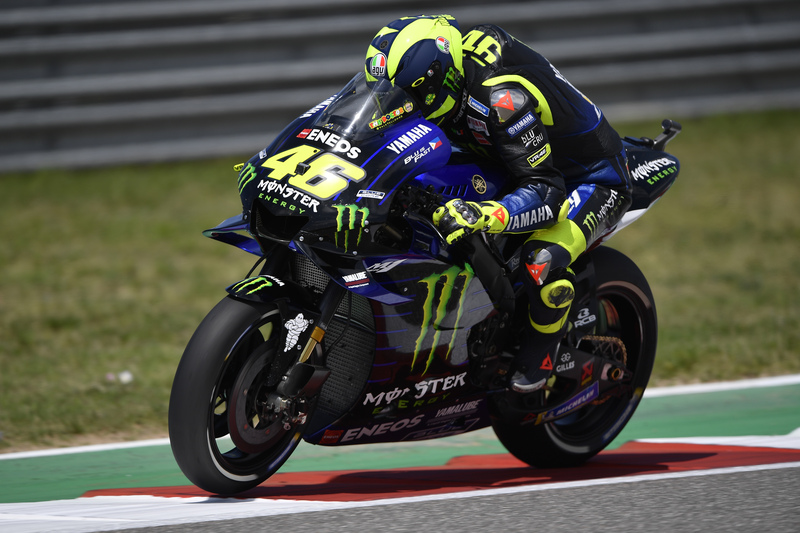 Considering the pace of his stablemates this weekend, the feedback the Desmosedici is giving him is presumably not so ideal, but the #43 is able to ride around that and make it do what he wants anyway. Whether Miller can do that for forty minutes tomorrow remains to be seen, but a top three is potentially on the cards. 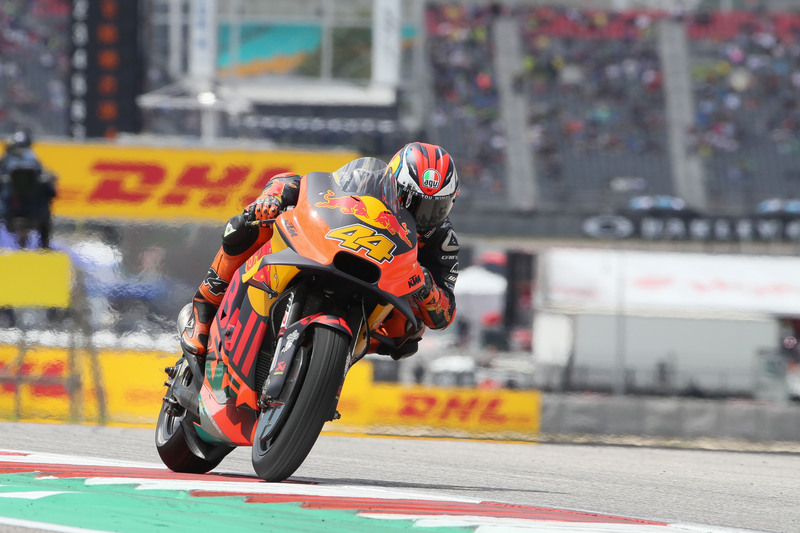 Despite Miller’s ignorance of his bike’s apparent problems, it is Pol Espargaro (Red Bull KTM Factory Racing) who was the star ride of Saturday in the Lone Star State. The Spaniard put the KTM fifth on the grid, KTM’s best MotoGP qualifying, with a lap which was undoubtedly seemed like, twenty evaded crashes knitted together for a time which was only three tenths away from the front row. For Espargaro to put KTM only six tenths away from Marc Marquez on a circuit where he is yet to be beaten is an incredible achievement. To make a similar result tomorrow is unrealistic, but there is no doubt that Pol will make the most of the opportunity he has to compare his RC16 with the front running bikes in the beginning of the race tomorrow and, whatever happens, today has made the weekend for the KTM MotoGP squad. Maverick Vinales (Monster Energy Yamaha MotoGP) was the rider Espargaro used as a marker for his fifth-placed time. Vinales himself qualified sixth, at the back of the second row. The Spaniard was fast all of yesterday, and was actually the fastest of everyone coming into qualifying, so might be disappointed with a second row start for tomorrow. Either way, the important part for Vinales is the start and the first laps, because he needs to be strong at the start so he can use his strong late race pace. It was a better qualifying for Alex Rins (Team Suzuki Ecstar) compared to two weeks ago, improving nine places on his Argentinian grid slot with seventh place. The Spaniard has been quite quiet this weekend, not making anything spectacular, but he should be there in the race fighting for the podium. Joining Rins on the third row of the grid are Petrucci and Fabio Quartararo (Petronas Yamaha SRT), the rookie impressing again on the satellite Yamaha, out-qualifying teammate Franco Morbidelli by three tenths. After a good run in Q1, Jorge Lorenzo’s Q2 session was compromised at the end of his first flying lap when he suffered the same problem of a chain coming off his RC213V as Marquez suffered in FP4 back in Argentina. Lorenzo parked the #99 RC213V up at the end of pit lane (mimicking Marquez in 2015) and ran back to the Repsol Honda box for his spare bike, but could only manage eleventh from there. Last in Q2 was Francesco Bagnaia, who crashed both his GP18 Ducatis, and ended the session frustrated and two seconds off the pace having only clocked one semi-representative lap time. As previously mentioned, Andrea Dovizioso failed to make it out of Q1, and the second-placed rider in the World Championship will start tomorrow’s race from a lowly thirteenth. Joan Mir (Team Suzuki Ecstar) and Takaaki Nakagami (IDEMITSU LCR Honda) will join the Italian on row five tomorrow. Row six sees Aleix Espargaro (Aprilia Racing Team Gresini) in sixteenth ahead of teammate Andrea Iannone and the impressive Miguel Oliveira (Red Bull KTM Tech3) who once again out-qualified Johann Zarco (19th) on the Red Bull KTM Factory Racing RC16. Joining Zarco on row seven tomorrow will be Karel Abraham (Reale Avintia Racing) and Hafizh Syahrin (Red Bull KTM Tech3), whilst Tito Rabat (Reale Avintia Racing) will line up alone on the back row.